Our Mt. Everest climbers have used Lobuche Peak as a warmup climb for many years. This is also a great high altitude training climb for people with Mt. Rainier skills, along with a classic trek. We will review cramponing and fixed rope techniques before heading up. IMG's Everest programs are recognized worldwide as simply outstanding, with a reputation for our highly professional staff of leaders, climbers and Sherpas, first-rate logistics and our resulting safety and success record on the mountain. Under the direction of legendary climber and expedition leader Eric Simonson, we offer an exciting array of Nepal options from treks to summit climbs. We have designed our programs to be truly unique and special  not like anything else you'll find on the market, so please read on! If you would like to visit Everest Base Camp, and stay longer and go higher, bring your crampons and ice axe and add a climb of Lobuche Peak, to over 20,000 feet (we stop at the false summit  the real summit is a very difficult technical climbing). Our itinerary includes staying in lodges between Lukla and Pheriche, then in our custom Lobuche Peak base camp (for fantastic acclimatization hiking) for several nights prior to moving on up to Everest BC at the beginning of the expedition. Then our Lobuche climbers, guides, and Sherpas will drop one day back down the valley to climb this beautiful peak, with world class views of Everest from the summit. Afterward, trek back out to Lukla with our crack Sherpa team for the flight to Kathmandu. From the beautiful Lobuche Base Camp tucked up a side valley from the EBC trek route, the route climbs to a high camp, then from there up rock scrambling to the glacier, which leads to the summit ridge. The steeper parts of the climb to the ridge are normally fixed with about 500 meters of rope. 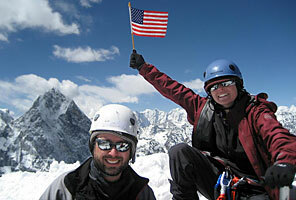 Lobuche Peak is a perfect objective if you are fit and have Mt. Rainier type skills. (ice axe, crampons, roped glacier travel). We will review use of fixed ropes for climbers who have not done this before.